When all else fails, this guy makes them laugh. Their eyes sparkle with anticipation when they see him coming wearing the impish “I’m gonna get you” face. And they BOTH just LOVE the tickles!!!! But he’s also there when they cry and he loves holding them when they fall asleep. I personally love when he spots a teaching moment and captivates their attention effortlessly. He takes such good care of us all and never complains. He definitely does his share (and then some), whether it’s the countless trips to get dinner when mommy fails to plan ahead, or the early mornings when this night owl isn’t ready to get up. This guy deserves so much for this Father’s Day, but I know he has all he really cares about right here in this photo, and I love him even more for that. It’s ok to be jealous. Grandma’s Easter bunny cake. Complete with dyed coconut for grass. Eat that! Yes she did, and don’t you forget it! Funny story. When D woke up he went to the bathroom all groggy, and started to wipe away the stuff on the mirror so he could see… Of course we had to “notice” the picture to get him to realize what it was. “What are you doing? What is that? !” asks Daddy. “It’s a snowman and I can’t see.” Says D.
“Well where did it come from?” asks Daddy. “I don’t know!” Says a flustered Davis. Then he whips his head all around our tiny bathroom with no real hiding places. Then he slowly opens the medicine cabinet and sure enough, there was Chippy. Just shows this kid takes a while for his engines to be on all cylinders, just like his mama in the morning! We think about epilepsy every day. And yet, it’s good to still have a month to think about it, as a message, rather than as a disease, life-threatening illness, never-ending challenge, burden….. I could keep going. Here we are 16 months into our journey, and I am trying to be committed to doing more for the cause. 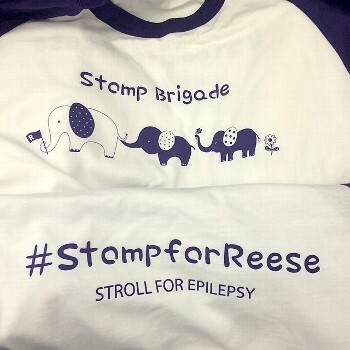 Because it’s not just a cause, it’s for Reese. If research was further along and equipment was more in tune with small brains like hers, we might not be sitting here with such little information. The waiting is agonizing. The fact that it’s because we don’t know enough, in today’s technology age, is so hard for the tech geek in me to swallow. We kicked off November with an adult night out at the North Texas Epilepsy Foundation’s first gala fundraiser. We donned our boots and tried to do our roots right, attending a cowboy chic dancing and casino night at Gillys. Everyone is coming with us next year and we are going to make it a huge party of our own! The most important part to us was connecting with the foundation’s director and getting to see a familiar face from our support group meeting. As if we needed the daily reminder, but the foundation’s Facebook page reliably keeps posting new facts or awareness messages that I debate whether to share to all my friends or not. Believe it or not, I am pacing my rhetoric. I worry people will tune out and be annoyed. And I really don’t talk about it for sympathy. I look back to 22 months ago — my old self — and it never occurred to that old me you could be so affected by seizures. Not sure I even understood what one was. Good news is there are tons of examples from others more experienced in this message than we are. It’s really a communicator’s dream to have plenty of content to work with. Which is why I’ve treated this like any other communications plan I would build, and I’m plotting when to post what and space out what we are going to do, to make it interesting, and informative for you. This weekend, we turned up the dial and it was all about epilepsy. We were surrounded with support after we took a big leap and asked our soccer team to wear purple ribbons during the game. We have a few good pictures to remember the moment. Bryan is my hero after this weekend. I hadn’t prepared well enough and was going to put the ribbons together Saturday morning before the game. But then late Friday I learned from our Neurologist’s office they had a seminar at the hospital on surgery options. Seeing I could be in two places at once, Bryan and Davis made the trip to JoAnn’s, got the ribbon and did all the cutting, gluing and pinning to create these beauties. Like I said, my hero. Reese and I headed downtown for our seminar and she got to be snuggled on by volunteer baby-sitters, and her usual fans from the Neurology department. Yes, they work on Saturdays sometimes. They are amazing. We were cutting it close to get back in time for Davis’s game, with the 45-minute drive, but we got there for the second half. The guest of honor snoozed in the car, but woke up just in time for post-game pictures. More to come. Highlights from the seminar to come separately. Davis: When I go to kindergarten is Reese going to Goddard? Me: Why do you want Reese to go to school? Davis: Because I want her to meet new friends. Can’t make it up… He is always going to be looking out for her. And you can bet my eyes welled up. She really picks up the pace to race after him. And he loves all her attention. A perfect match! Super fun weekend now that it’s warm. We ended Sunday with a little Babyzilla busting out of the prison gates and into Lego Town, successfully destroying the Volunteer Fire Station. R and I worked on our Van Gogh-inspired finger painting. We spent the morning at the park where D showed R how to hang like a monkey, then showed her the big fish he is going to catch some day. Davis even got to drive R down the street Slow Ride-style in his souped-up jeep.